Robert Herrick. To the Fever, Not to Trouble Julia. TO THE FEVER, NOT TO TROUBLE JULIA. Her skin's most smooth and clear expansion. Quite dispossess'd of either fray or fret. Where no one piece is yet unlevelled. Dead thee to th' most, if not destroy thee all. More shak'd thyself than she is scorched by thee. Domenico Feti. 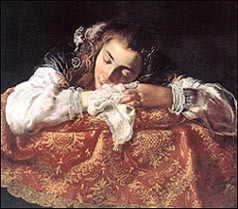 Sleeping Girl, c. 1615. Museum of Fine Arts, Budapest. London, Lawrence & Bullen, 1891. 100-101.